Trekking in the glorious mountains of Nepal is a pleasure in itself. The open skies, the emerald mountains, and crisp surrounding air make your adventure heavenly. Luxury and comfort add to making a dream vacation. On top of that, the tour of amazing cities their rich cultures, food and art in style and comfort are a whole new experience. Luxury trekking and tour in Nepal are absolutely possible and highly encouraged. You won’t feel disappointed. You will have a comfortable stay in spacious hotel rooms. Enjoy a variety of menu to choose from. Chill in a 24-hour hot water supply and western toilets in the rural areas of the country. You will embrace the best of the adventure. Thereby, enjoying your accommodation in the best hotels and resorts. Luxury traveling in Nepal provides you with the opportunity to dive in the diverse and rich cultures of Nepal. Alongside with the modern-day facilities that could be lacking in the rural areas of your trek. Luxury traveling in Nepal is best if you are traveling with children or elders. Or if you want that extra comfort. The luxury travels will allow you to experience everything from scenic mountains to thrilling adventures. Not to mention the amazing cultures and food as well. You could also indulge in bungee jumps and whitewater canoeing. Or peaceful walks through the Buddhist monasteries and other peaceful temples. So, if you are looking to travel to Nepal with luxury, allow us to organize them for you. Let me usher you through some well-designed packages that will make your trip more luxurious and adventurous. Here are some. The Everest Base Camp luxury trek is an iconic trek in itself. This is a 10-day trek, but we can design to fit your schedule and plans. Luxury treks enhance your trekking experience and make it fruitful. The privilege of a hot evening shower before bed is one of the perks you could expect. An absolute necessity after a long hike. This facility might not be possible in normal trekking packages. You will accommodate in Luxury hotels like The Yeti Mountain hotel and enjoy delicious meals. With the best views of the mountains in the backdrop, a warm comfortable bed, you can enjoy perfect evenings to jot down your experience in your journal. The Everest Base Camp Luxury trek thrives to make you feel comfortable in adventures. The Gokyo Chola Everest Base Camp luxury trek is the trek in which Everest Base Camp trek combines with Gokyo valley and the high Chola Pass trek. The trek is of 14 days it is customizable. This trek is among the challenging ones. Luxury packages, however, contribute to ease it a bit. The experience is amazing. Gokyo valley offers beautiful landscapes and awe-inspiring lakes. The clear blue water is sure to make everyone feel like they are in heaven itself. This trek also includes the beautiful hike to Kala Patthar- the best viewpoint to witness the amazing view of Mt. Everest, Mt. Ama Dablam, Mt, Nuptse, and Mt. Lhotse. Stunning views of many giant Himalayas including Mt. Everest, Mt. Lhotse, Mt. Makalu, Mt. Amadablam, Mt. Nuptse, Mt. Kanchenjunga, and Mt. Pumori. Incredible mountain views from Gokyo Ri, Kala Patthar, and Everest Base Camp. The 360-degree view from Gokyo ridge. The Namche Everest Base Camp luxury trek will allow you to experience the adventure of Everest Base Camp trek. But, without compromising your comfort and luxury. 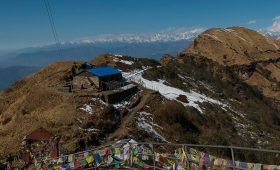 This is a short trek as you will take a helicopter ride to Syangboche from Kathmandu. Then you will hike down to Namche Bazaar. You will then move on with your trekking journey. 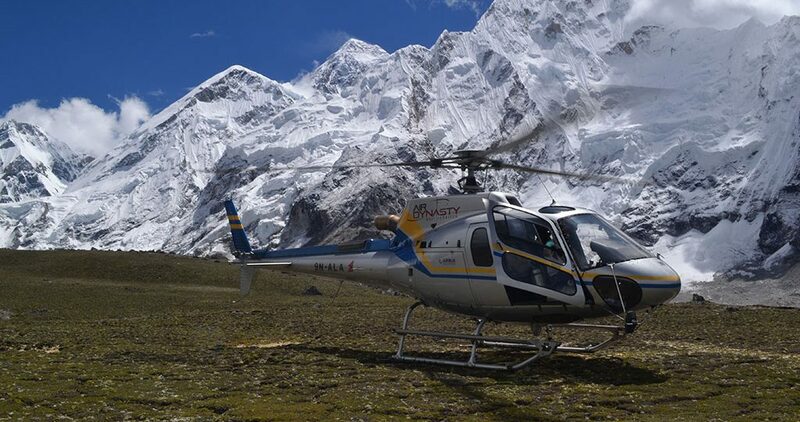 After you walk all the way up to the Everest Base Camp you will enjoy a helicopter ride back to Kathmandu. An amazing way to enjoy a birds-eye view of the Himalayan vistas. You can complete this super exciting trek in about 8-days. A full insight of the Sherpa culture and traditions. The Everest Panorama Trek is perfect for those trekkers who do not want to trek up to the Everest Base Camp. But still, want to see the Mountain in close proximity. It is an 8-day short trek. The trek starts with a flight to Lukla and then a short trek to Phakding. The next day you will be trekking to Namche and then rest for a day there. The trek continues the next day to Tengboche. You will see breathtaking views of the magnificent mountains from here. Then you will be trekking back to Namche and make your way back to Lukla. But, your adventure doesn’t end here. The next day you will be flying back to Kathmandu. And have the pleasure to go sightseeing in the fascinating city of Kathmandu. The Everest Panorama trek is ideal for trekkers to experience the rich cultures and beautiful landscapes of the Everest region. As well as get to know many other cultures and traditions more up and personal. The Upper Mustang region is one of the most beautiful trekking routes in Nepal. It welcomes a large number of local as well as foreign tourists throughout the year. This is due to its incredible beauty and rich culture as well as old monasteries. The Upper Mustang region has a high influence of the Tibetan Culture. Due to this, the entire region has its own unique tradition and culture. Years of isolation have kept the culture, lifestyle, and heritage unaffected by modernization. This is the perfect place to go for a getaway from the hustle bustle of your busy life. And get some adventures as well as peace of mind. The Upper Mustang luxury trek route starts from the world’s deepest gorge, Kali Gandaki Region. And ascends into the world’s highest regions of Lo-Manthang Valley. It is perfect for all adventure seekers, experienced as well as new trekkers. We can customize this 13-days trip as per your convenience. Observe unique and beautiful architectures. The Kathmandu valley itself is a fascinating place. A combination of old customs mixed in with the new! It just feels like a whole different world and provides a whole new experience. In the Kathmandu valley Luxury tour you will help you immerse in the rich cultures of the place. And experience the best services. You will be staying at the best 3 stars and 5-star hotels and receive the best of foods and drinks. 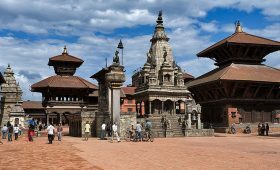 You will visit Bhaktapur and see the finest works of craftsmanship. You will walk around Golden Gate, Art Gallery, 55 windowed Malla Palace, Nyatapola Temple, and Dattatreya Temple. You will visit Kumbeshwar temple, Mahaboudha Temple, Krishna Temple, Golden Temple. And several other places in Patan Durbar Square. You will go sightseeing around Swayambhunath which lies at the hillock. It presents the view of Kathmandu Valley from the top. You will also get to visit Boudhanath Stupa, the largest stupa of Tibetan Buddhist Culture in the world. Kathmandu offers travelers a chance to immerse themselves in its rich cultures. You will feel surrounded with historical architectures and amazing ancient arts. Pokhara is a famous destination for people who want to relax and rewind. It is popular among travelers especially because of its beautiful scenic views and gorgeous lakes. 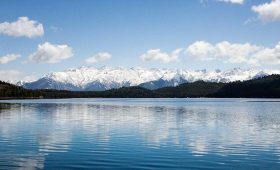 Pokhara is also the gateway to various mountain treks. The lake city of Pokhara offers luxurious stays at the best hotels and a variety of food options. It becomes even more beautiful at night when the city is glowing with lights and the lakes reflect the beautiful lights. It truly makes for a heavenly sight. Luxury travel in Nepal is an amazing experience. Exploring and seeking adventures while still having comfort is quite a treat. Along with the various cultures and traditions, it could be quite a learning process. You will be staying at the best lodges and hotels with top-notch services and delicious foods. In addition to those, the best guides will always be by your side who will help you to make your journey even better. All in all, luxury traveling in Nepal is perfect for those wanting to experience the amazing mountains, rich histories, ancient architecture, and art other landscapes in style. If you have any queries or want to book your luxury tour, feel free to contact us at any time. Next PostWhat is the Fastest Way to Everest Base Camp?